On this day in 1973, the great Roberto Clemente becomes the first Latin-born player to be inducted into the National Baseball Hall of Fame. The late Pirates outfielder, who died tragically only a few months earlier in a airplane crash, was elected posthumously after the mandatory five-year waiting period was waived. Immensely proud of his Puerto Rican heritage, Clemente was an incredible baseball player and an even greater human being. He saw his career in baseball as a way to help all minorities make their lives better. There is no single set of words to express the full extent of Roberto’s legacy. But for Puerto Ricans, José Buscaglia’s Cenotaph, installed in Carolina, Puerto Rico in 1999 may be the most encompassing expression. A cenotaph commemorates and exalts the life and virtues of a hero whose body has been lost in action and cannot be recovered from the field of battle. 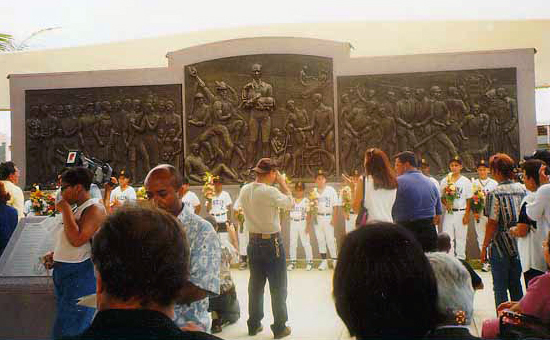 The three monumental reliefs which constitute the Clemente Cenotaph relate the main events in his life from birth to death. Buscaglia’s work honors Clemente as one who gave all for his country. Son of Carolina, Exemplary Citizen, Athlete, Philanthropist, Teacher, Hero of the Americas and the World.